Nowadays, having your music used in an advertisement is a surefire way to get a hit. 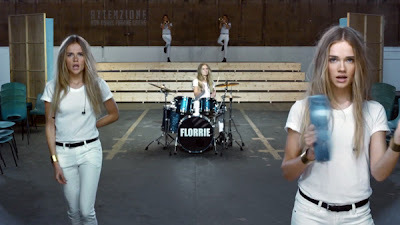 Live A Little has been chosen for the new Sony headphones campaign and, although it might not be an official release, it's the perfect opportunity to get acquainted with Florrie. And what's better than one Florrie? Three Florries. Or Florrie-cubed if you will. The video sees her showing off her skills on drums, guitar and singing - skills she developed as the in-house drummer for Xenomania, the hit factory behind most of Girls Aloud's top tracks (amongst others). With three EPs already beneath her belt and an ever-growing global fanbase, Live A Little sees Florrie finally hitting the mainstream. Whilst she's experimented with synth-pop on her EPs, Live A Little has more of a sixties feel - all trumpet calls, guitar riffs and a pop chorus that packs a punch. The hook-up with Sony will guarantee Florrie some much-deserved attention amongst all the product placement, so expect to hear more from her over the coming months. NB. Enjoyment of this song does not require the use of Sony XBA-C10 in-ear headphones. Listen: You can download Live A Little for free on Florrie's website.